Whenever this question comes up, I have to fight the urge to say: Go put your left ankle on a train track and come ask me again after a long freighter goes by. Why do I have this urge? Because at one level, it’s a dumb dope-smoking question. People who are being tortured or dying of cancer or, I would assume, getting their feet crushed by locomotives don’t spend a whole lot of time speculating about whether the experience is real. Why do I resist? Because at another level the question is valid. And so I try to answer it –for the questioner, but mostly for me. Being a psychologist and citizen rather than a philosopher or theologian, my interest in truth is practical–even utilitarian. I don’t really care whether the world that I (or my clients or elected representatives) live in real in some absolute sense. I don’t care if it is “merely” phenomenology or a dream or an ancestor simulation. Those questions are fascinating, but not important. If it’s a dream, I’m in it till I wake up. If it’s a simulation, I have no way of knowing what’s on the outside. Whether my self-conscious existence is the product of a god or a big computer, I’m inside the game. And inside the game, some kinds of phenomenology are different than others. No matter how well a Buddhist monk has transcended hunger, if he doesn’t eat, he dies. If someone puts a gun to his head while he’s meditating and pulls the trigger, he doesn’t meditate any more. To insist that it is “all in our heads” denies the reliable, predictable and useful distinction between a monk meditating and a monk without a brain. That’s how it is, inside the game. And to date everybody who claims to know what is on the outside makes those claims using faulty inside-the-game evidence. So, the definition of truth I care about is this: Within the game, what are the rules? What are the cause and effect contingencies that affect the things I value – like my left foot. As soon as we acknowledge that we care about anything, even something so basic as preferring existence to non-existence, then a whole set of outcomes (and by implication, cause-effect relationships) become important. This is where the freight train response is actually on target. It brings into sharp relief the fact that few dope smokers or philosophers if dragged to the track would consider the ankle and locomotive in the same category as their dreams or academic speculations. Being human means, by definition, we have some things we care about, because people who don’t aren’t around long. My insult to the fields of philosophy and theology is conscious. Both fields have sneered down their elegant noses at empiricism for literally thousands of years. In consequence, neither ultimately has been more generative than masturbation. This is not to say that masturbation, or philosophy, is useless. But let’s do say what’s real. Neither produces new life. Introspection, unencumbered by data, failed to generate a coherent understanding of human mental processes, let alone a vaccine or a solar panel. So did theology, that vast web of semi-logic that brilliant humans built on top of ancient ritual and oral tradition. Theology utterly failed to heal disease (despite millennia of prayers, exorcisms, and sacrifices) and never even considered a green revolution or a sky scraper. By claiming knowledge of what lay outside of the game, theology failed to discern what lay within. The rules of the game itself began emerging only when a few early monks and philosophers stuck their soft clean fingertips in the dirt. That’s when knowledge began to accumulate. It’s when we humans started gaining shared power to predict and control the contingencies we care about. The scientific method of inquiry has been called, quite simply, “What we know about how not to fool ourselves.” That’s all it is. Very basic. To make things worse, it’s not perfect, and in fact, has been subject to continuous refinement for hundreds of years. But accountable, empirical—in other words, scientific– inquiry has made the difference between horse carts and space travel. This is what I’m talking about when I accuse Christianity of violating its own proclaimed value on truth. It puts forward a set of ideals that have to do with health, prosperity, freedom and social harmony as well as love and joy. What does Yahweh give his people? A land flowing with milk and honey. How does Jesus minister? He heals. What does Paul promise? Love, joy and peace. What is heaven? Riches, health, and eternal bliss. Christianity espouses these values and then it gets the in-the-game contingencies wrong. It articulates a psychology, a biology, a physiology, a geography, a physics, a political science, and a moral contract each of which is –should this surprise us?—as primitive as our bronze age ancestors who plagiarized the Torah, and our iron age ancestor who laid down that hallucinatory classic, the book of Revelation. In addition, it violates the most elementary principles of “what we know about how not to fool ourselves.” This means that it is inevitably procedurally prone to stagnant self-deception. We can spend our time taking philosophy and theology courses, either refraining from any assertion of truth, or asserting absolute Truth and then dying in tangential superiority. Or we can roll up our sleeves and ask ourselves, What do I care about and what power do I have to make it happen? And not just what do I care about but what do we care about together? What are the core shared dreams of my people, and what truths do we need to discover to make them real? I’m a woman with a life mission that focuses on the well-being of the web of life that gave me birth and my fellow human beings within that web. Within the priorities set by this mission, there are enough real-world contingencies to be explored that I suspect they’ll keep me busy for the rest of my life. And if I’m wrong, if I run out, I imagine I can figure out where to get some good dope. 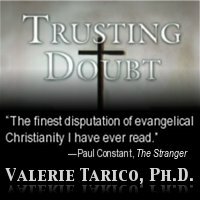 Valerie Tarico is a psychologist and the author of The Dark Side: How Evangelical Teachings Corrupt Love and Truth . This article is reprinted from exChristian.net. For comments, go to original . Fantastic post!!! I have been thinking about these very things a lot recently, especially truth and its importance. But like you have put it, I try to be more pragmatic about the usefulness of certain truths. Really, a great post. Your post is very interesting but beyond everything that I understand about religion. Jesus said to let the children come to him because they have simple faith. I try not to let my mind get too caught up in the theology of man. I cannot out think God.